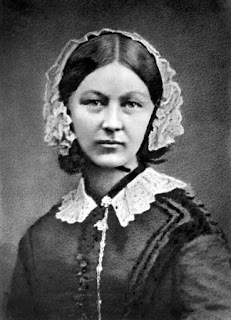 Florence Nightingale is famous across the world for being the founder of modern nursing. You may well be familiar with stories of "The Lady with the Lamp" and her contributions to treating the sick and injured during the Crimean War. But what you may not know is that Florence was also a pioneer in using Data Visualisation to tell a story. Born on 12th May 1820 into a rich upper-class British family, Florence spent most of her early years growing up at their lavish family estate in the South of England. She was highly educated by her father, something that was unusual for a girl at that time. From an early age, she demonstrated a gift for mathematics which would become extremely significant in later life. At that time, young women from affluent English families were expected to dedicate their lives to becoming wives and mothers. Florence, however, felt that her future lay in helping others and in 1844 she announced to her family that she wished to become a nurse. Despite the anger and protests of her mother, she set about training herself in the art and science of nursing. the Crimean War. It was this friendship that would secure her future path and in late 1854, Florence headed a large team of nurses and nuns sent to the Crimea under the authority of Sidney. One of my hobbies is Genealogy and I recently discovered that my great great grandfather George Johnson was a soldier in the Crimean war. He was one of the lucky ones who made it home, despite having served in 3 of the biggest battles at Alma, Inkerman and Sevastopol. Official statistics of British casualties paint a horrific picture. Of the more than 21,000 who died during the war, less than 5,000 were actually killed in battle or died later of wounds. More than three times as many men died from disease and that figure rose to more than 10 times in some months. You were far more likely to die of an illness like cholera, dysentery or typhoid than from battle. A handful of historians have questioned exactly how much impact Nightingale had on disease amongst soldiers in the Crimea. But the general consensus seems to remain that her actions undoubtedly saved thousands of lives. That subject is somewhat outside the scope of this blog and my expertise however, so I won't delve into it any further here. If you want to know more, you'll find a lot written about Florence Nightingale and I'd encourage you to also take a look at the less well known Mary Seacole. Whilst in the Crimea and when back in England after the war, Nightingale actively petitioned the British Government to take action to improve sanitation, both at home and for soldiers abroad. In doing so, she quickly realised that the majority of politicians and officials were lacking her aptitude for mathematics and as a result, were finding it difficult to understand a traditional statistical report. So she started to include diagrams and charts in her reports to help to convey and emphasise her points. On 11th October 1858, Nightingale wrote a "note" to Queen Victoria in which she included a new type of visualisation. The original note and diagram can be viewed here in the Royal Collection. 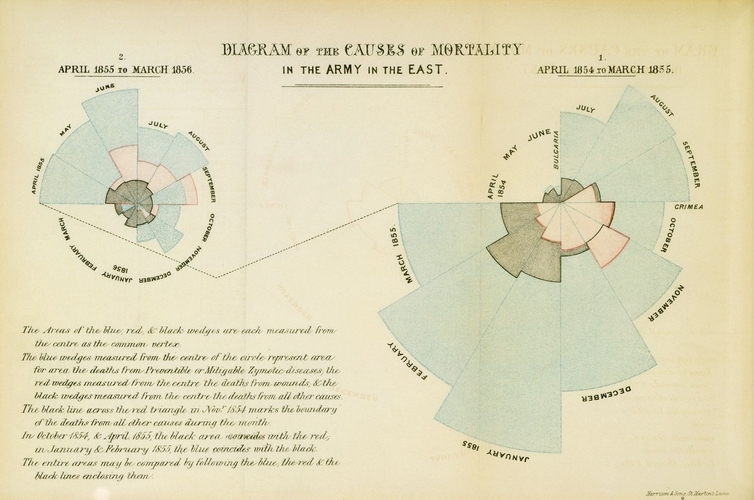 The diagram clearly showed how many more soldiers were dying from disease than battle and as a result, she is today credited with inventing what we now refer to as a Polar Area Chart/Diagram. 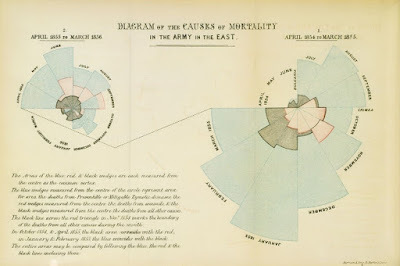 Diagram of the Causes of Mortality in the Army in the East by Florence Nightingale, 1858. It is worth pointing out that earlier examples of Polar Area Charts do exist (for example,André-Michel Guerry in 1829) and it is unclear whether Nightingale had seen any of these. What is clear is that whether or not she invent them, she used Polar Area Diagrams and other Data Visualisations to great effect. This kind of graphical statistical representation may today seem obvious and ordinary, but in the 1800's this was truly revolutionary and marks Nightingale as pioneer of Data Visualisation. Her peers clearly agreed and in 1859 she became the first female member of the Royal Statistical Society, later becoming an honorary member of the American Statistical Association in 1874. Polar Area Charts are also sometimes known as Courbes Circulaires, Coxcomb Diagrams, Wind Rose Charts and even Nightingale Rose Diagrams. They are most effective at displaying cyclic data and are commonly used by meteorologists to display seasonal variations. They are broadly similar to a regular pie chart but differ in one simple way. In a pie chart, the segments are all of equal radius (the distance from the centre of the circle to their edge), with each segment's differing angle representing the underlying data. In a Polar Area chart this is inverted, with all segments being of equal angle but their differing radius represents the data values. In Nightingale's diagram above, she divides each circle into 12 segments, each of 30 degrees and representing a month of the year. The area of each segment represents the deaths from preventable disease (blue), battle wounds (red) and other causes (black). It's clear to see how the majority of deaths were occuring. When Nightingale died at home in London on 13 August 1910, at the grand age of 90, she undoubtedly left a huge legacy. Her contributions to nursing and public sanitation are legendary, but I would argue that her contributions to Data Visualisation may be almost as important. If you haven't read it already, check out my earlier post on another Data Visualisation pioneer Michael van Langren. Very interesting. Thanks for finding the time to Blog again. I love the fact that these charts were created manually and beautifully drawn. I can't wonder though if a stacked bar chart would have been easier to interpret - I'm not sure if it's the area of the segment that is relevant or the height / radius of it. Perhaps the most important thing is that it was used to get a point across and that resulted in a desired and beneficial outcome. Sometimes the ends justifies the means (even for pie charts). Glad you enjoyed it and I hope this is the start of breaking the posting hiatus. Juggling a growing business and a young family just took it toll. I too would probably find a bar chart much easier and quicker to interpret. I do wonder though if it is simply because that is what we are far more used to today. Personal preference no doubt plays its part also. Nightingale states it is the area of the segment so a segment twice as large would not be twice the radius. And it's worth pointing out they they are all measured from the centre as opposed to being stacked. A lot of people do bring out the pitchforks for pie charts though and I'm sure some would do the same to a polar area chart given the chance. I do have a post I started on why some of the things said are valid and when a pie chart might be best used. I'll try find the time to finish it soon.